At Stable Micro Systems we have long recognised the need to constantly expand the wealth of possibilities of testing, presentation formats and analytical solutions in our Exponent software. However, we also recognise that a considerable percentage of users require a simple test and data analysis solution, that users may be testing in a high-throughput production environment at varying skill levels, or that users require a quick, easy to operate method on an infrequent basis. This fully established software package is set to continue to be the software of choice for the professional or advanced texture analyst, those users requiring long-term flexibility of operation and analysis and those users requiring additionally synchronised data measurement alongside their traditional texture analysis data. Exponent software will maintain its ongoing expansion of testing procedures, presentation formats, data analysis features and enhanced security options. The aim is to provide the most powerful and flexible testing analysis solution available, which is of particular importance for those in Research and Development. • Additional Data Capture options – Temperature, Acoustics, Dough Inflation System, Powder Flow Analyser, Resistance, Video Playback etc. This 'lighter' version of Exponent software is well suited for simple texture analysis testing offering flexibility and simplicity of use. Users at all levels will appreciate the minimum learning and training required, whilst the package provides all of the general capabilities you need to run tests quickly and efficiently to achieve maximum productivity. Exponent Lite provides the same basic functions as Exponent but the complex features required by advanced users or necessary for sophisticated operation have been removed – straightforward texture analysis without the 'bells and whistles'! Upgrading to Exponent is possible at a later date if required. Both software packages provide a flexible graphical user interface to choose test settings and acquire test data in a real-time graphical display with free download of upgrades throughout the life of your instrument. 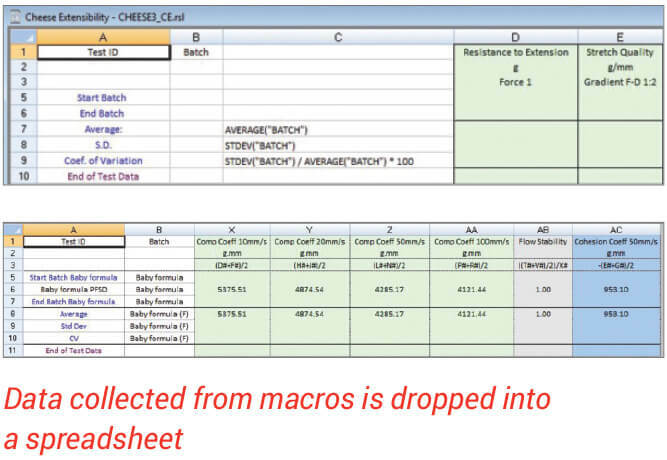 Macro and spreadsheet facilities are built-in to aid automated data collection and analysis. The following presents a few highlights of the software which can only be fully appreciated by a live demonstration. Making measurements with any analytical method or instrument requires calibration to ensure the accuracy of the measurement. 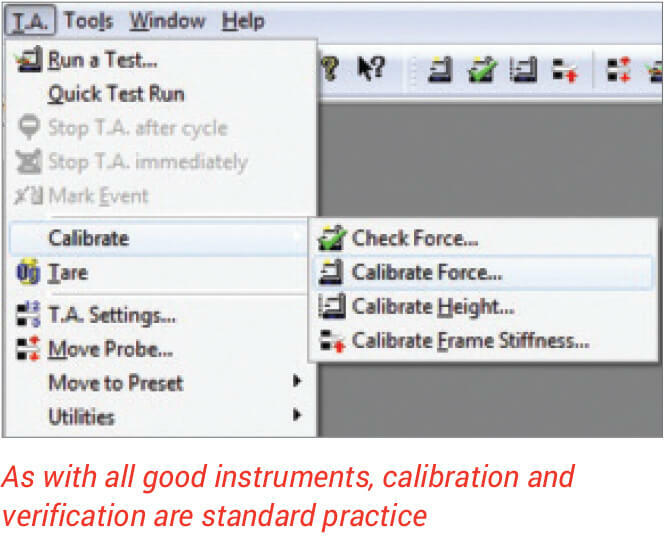 Exponent and Exponent Lite provide for the calibration of Force, Height and Stiffness and Force Verification – simple procedures which take only a few minutes. 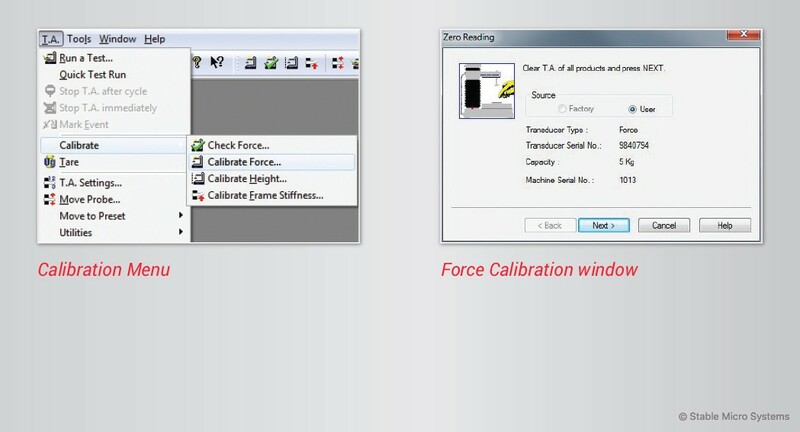 Calibration of both force and distance is carried out in-house at the end of the manufacturing process. 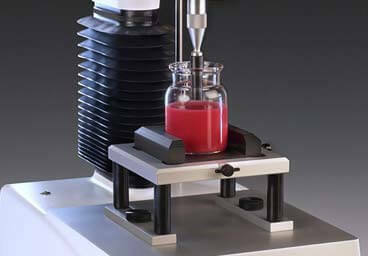 Customers can easily re-calibrate the instrument in their laboratories depending upon their good laboratory practice. The accuracy of all of our instruments can easily be checked in terms of speed, distance and force measurements to meet the more demanding regulations of certain industries. Testing starts with your choice of settings. This will depend on the type of test you wish to perform and the properties which you wish to investigate. 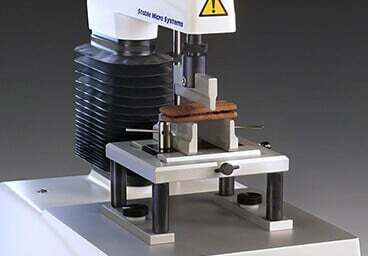 There are several options for specifying the way in which the texture analyser is to test a sample. The Samples directory contains an ever increasing range of over 180 projects from which users can select as a test starting point. 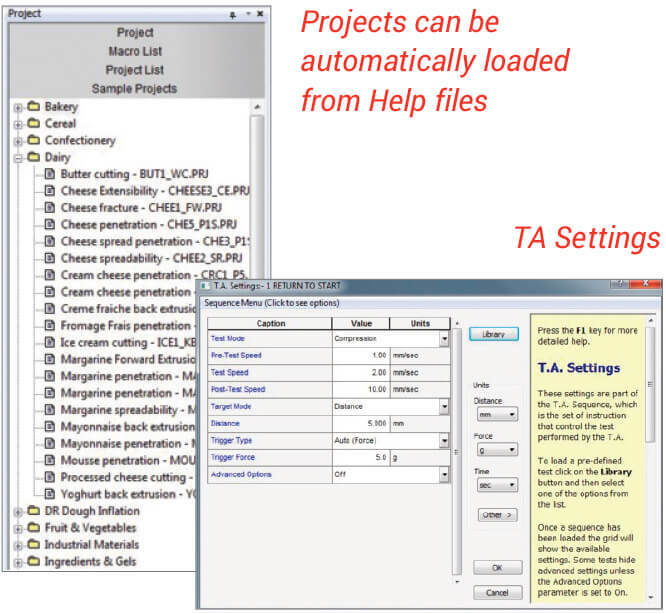 At the click of a button your chosen sample project can automatically transfer the required test settings to the instrument and load the associated macro, spreadsheet and report ready to analyse and display the results once the test is performed. 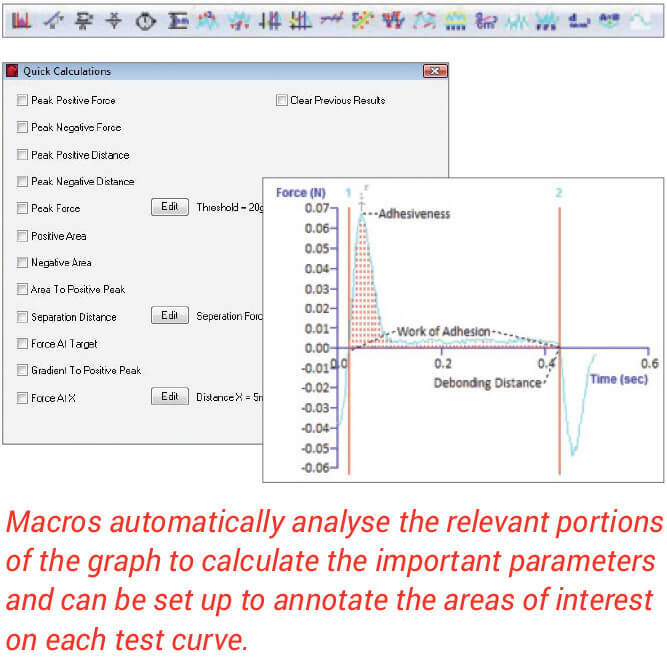 Test Settings and analysis Macro routines can be optimised to suit your particular applications and if routinely required they can then be saved as user-specific Projects. A Project combines all of the components required to initiate a complete test and analysis procedure and is the basis on which a user can centralise all files required for a specific product test. Alternatively it is very easy for you to write your own method for the particular analysis required. A series of classical Texture Analyser tests are included from which simple or 'enhanced' versions are available for selection. A TA Settings window is displayed which allows the user to specify such parameters as speed and test distance required for the test procedure. 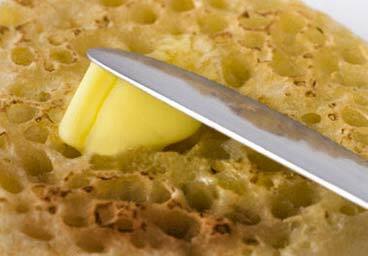 Advanced features within a test can be hidden for simplification. 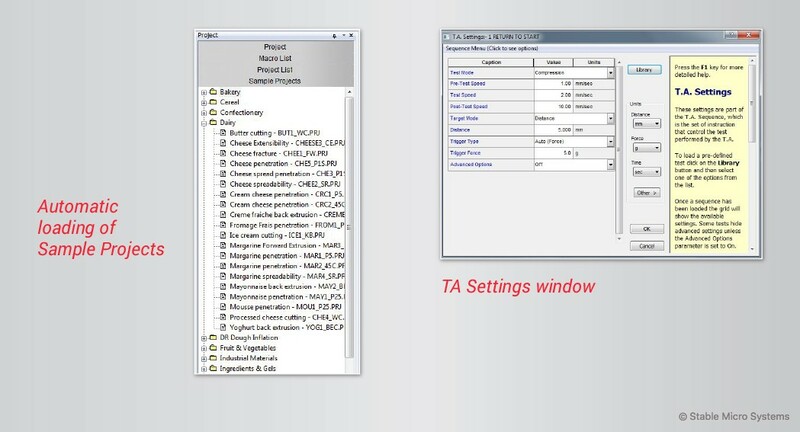 All TA Settings parameters have a caption which explains what each parameter does. Before testing, a Run a Test window establishes test options and post-test parameters (e.g. file name, probe used, etc.) 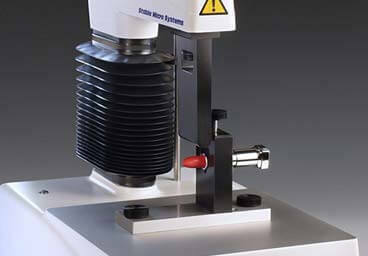 Sample and attachment details can also be specified for further analysis. Data can be captured at high speed which is a particularly important aspect when testing products that fracture or require high speed separation such as during the testing of adhesives. The ability to plug-in peripheral instruments is present in the instrument design to provide multi-channel data acquisition. This allows for many other measuring devices to be connected to the Texture Analyser and their data simultaneously collected, such as acoustic emission, temperature, humidity via Exponent software. During testing of your sample, force, distance and time values (and additional peripheral data values if attached) are collected and the real-time data displayed in a Graph window. The Graph can be annotated to highlight the areas of interest and its axes can be changed to display the data in different X and Y combinations. Logarithmic and second Y axes are also available to allow synchronous display of additionally collected data such as temperature. 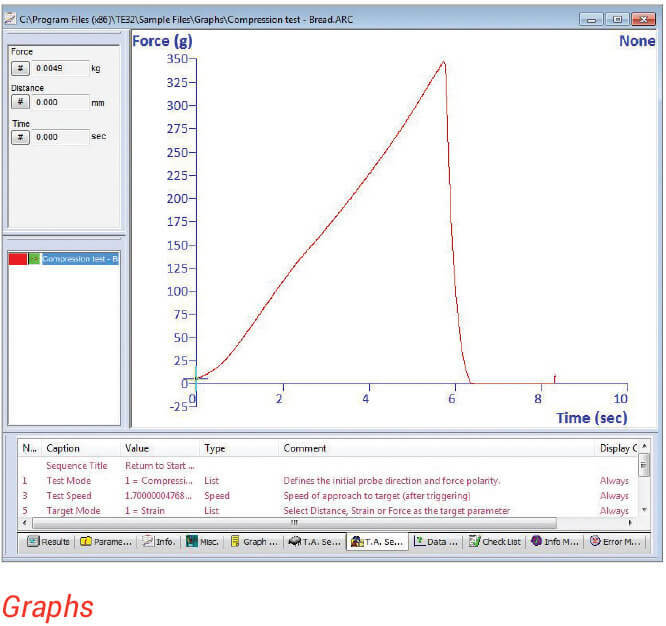 Graph files can include photos of the sample tested, and can also be exported as .bmp or .jpg. 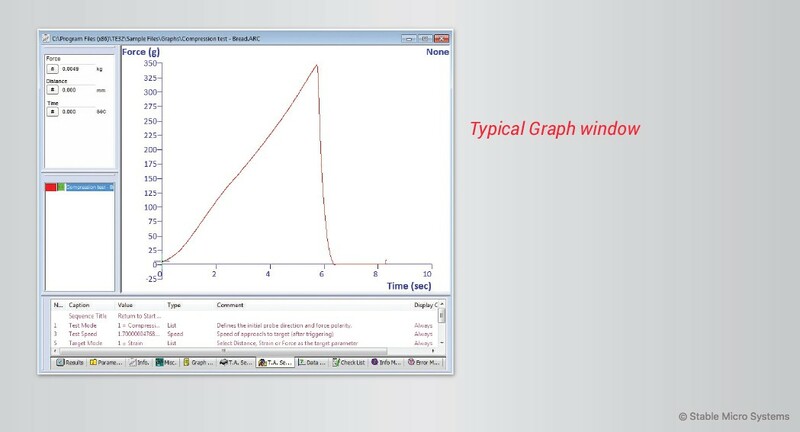 Once data has been collected and is displayed in a Graph window, there is likely to be a requirement to analyse it in order to interpret the results and draw conclusions. Exponent provides a wealth of analytical tools, from the most basic option of collecting a single force value to more sophisticated methods of curve smoothing or detection of inflection points. Almost any feature of a data characteristic can be recognised and recorded. Icons for the calculations of such parameters as Area, Gradient, Time Difference, Mean, Count Force peaks, Force Maxima/Minima etc. are quickly accessible on the toolbar or minimised to only those required by the user via the Customisable Toolbar option. Quick Calculations are a selection of popular calculations that you can choose from that will analyse the data to provide results in just a few steps. A Macro simplifies repetitive analysis and display. A set of instructions are listed and executed which automatically collect data from the graph. Tests can be automated with either intricate or simple macros, the latter being ideally suited to a production environment. At the end of each test, an operator need only concentrate on the positioning of their sample and starting their next test whilst the previous data is analysed in the background. Exponent not only provides an extensive library of macros that are ready to quickly analyse your data once your tests have been performed, but enables the writing of macros that can quantify almost any aspect of the data resulting from the test. The flexibility to perform such a wide range of sophisticated additional mathematical functions within the software is unrivalled. The analysed data is displayed in a Results window in customised spreadsheet format and if necessary extra calculations are made by the addition of more columns to further manipulate your data or produce other parameters using either your own or stored formulae e.g. Standard Deviation, Average etc. Multiple worksheets are available to separate product parameters from results and user data. Spreadsheets, text or images can be exported to other Windows applications for further specific manipulation/presentation if required. Once your range of tests are performed the collection of parameters you have obtained can be collated into a 'fingerprint' of each sample. Once data is collected in a spreadsheet, charts in a multitude of formats can be automatically displayed or designed to suit your data comparison needs. 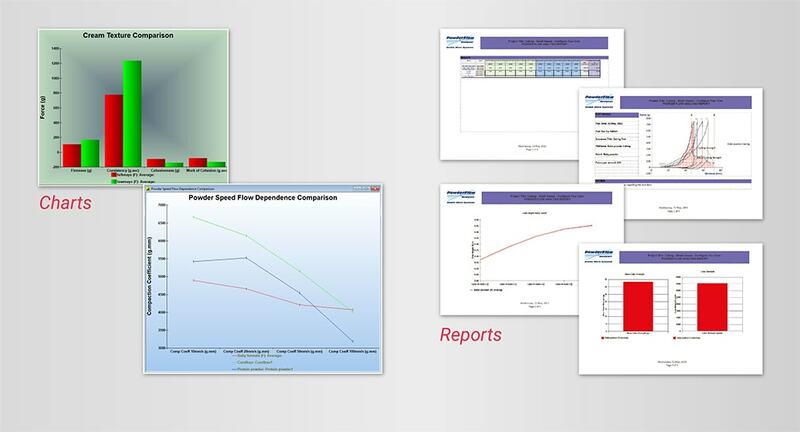 A Chart gives a visual representation of the data from the Results window to allow easier comparison and interpretation. The Chart Designer allows selection from 27 chart types (2D and 3D) and define rotation, position, 3D lighting properties, legend styles, base and wall styles, and axes types (stacked, normal and %). A Report is a great way to establish a strict format for presenting information for others. For example, reports allow users to present hourly online test results to their managers or to present well-formatted reports to marketing and customers. Reports may include graphs, results files, charts, pictures, logos, text, test settings, test preferences, batch numbers, information about the products tested, etc. 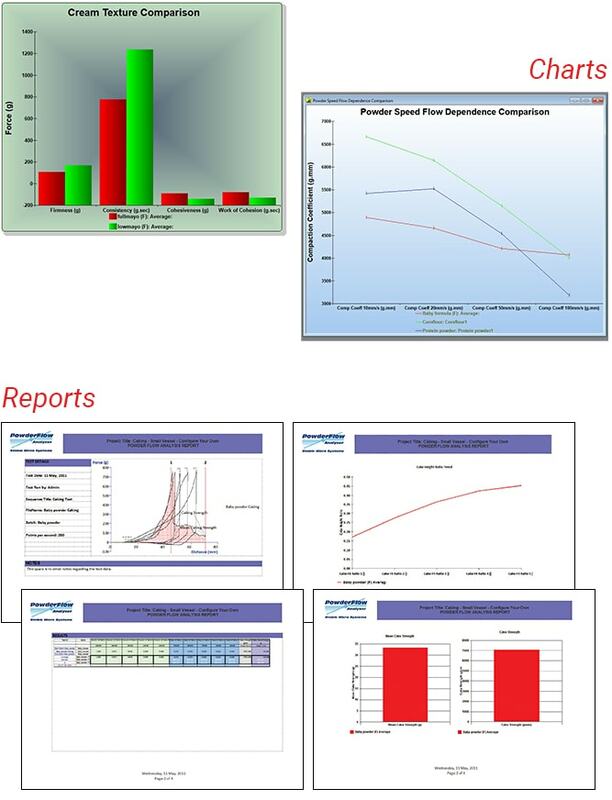 A Report can be a user formatted composed presentation of the complete analysis using the WYSIWYG word processor type interface. Alternatively reports can be automatically generated from active objects and fields when a report template is open which can be set-up to print, save or email when tests are complete. A Spell Checker, Thesaurus, adjustable fonts and styles and support for tables, OLE objects and export to HTML are also included. 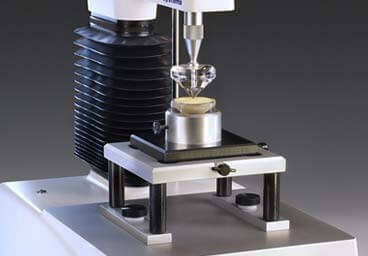 Programmable Sequencing: This allows total flexibility in the programming of the Texture Analyser arm movement. New test sequences can be written to accommodate sophisticated arm movement requirements, data capturing options and control of peripheral measurements such as temperature modules. 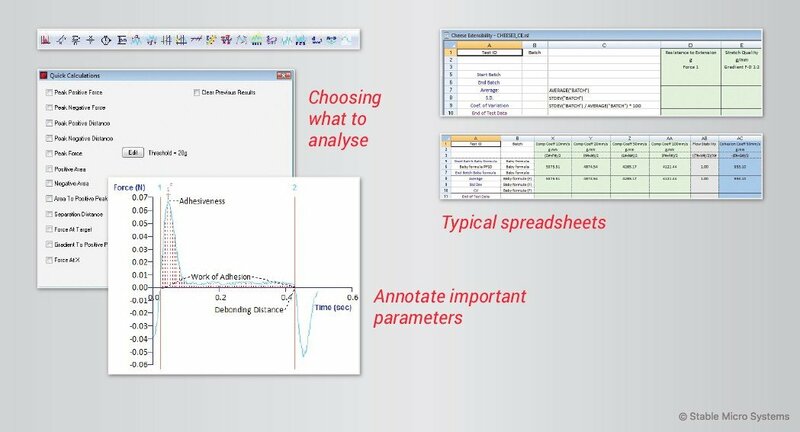 Advanced Data Analysis: Exponent provides a wealth of sophisticated analytical tools which are available for immediate use and quick interpretation. Mail To... At the end of your test, you can send your data directly from Exponent to your colleagues – a great feature for multiple location synchronisation which simplifies the distribution of Exponent files from one site to another. Test Maker: This is a useful facility which allows a user to simply build a customised test from a selection of standard arm movements. BASIC Macro Language: Access to advanced Exponent data and commands provides the ability to automate certain actions or tests. 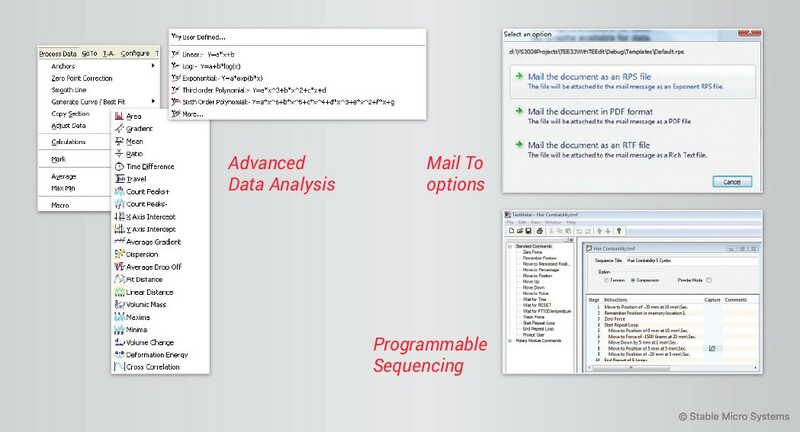 OLE Automation: This offers an interface for easy integration into many programming languages allowing total automation within a bespoke system such as automated sample loading or complex data collection systems. Add pictures to Graph files: The Project and the Graphs have a place to enter notes to describe a test method or setup. Why not add a photo of your test setup so it is easy to see how it was or should be configured? Test History Database: This feature tracks when tests were run and where they have been saved in the event that important data is misplaced. 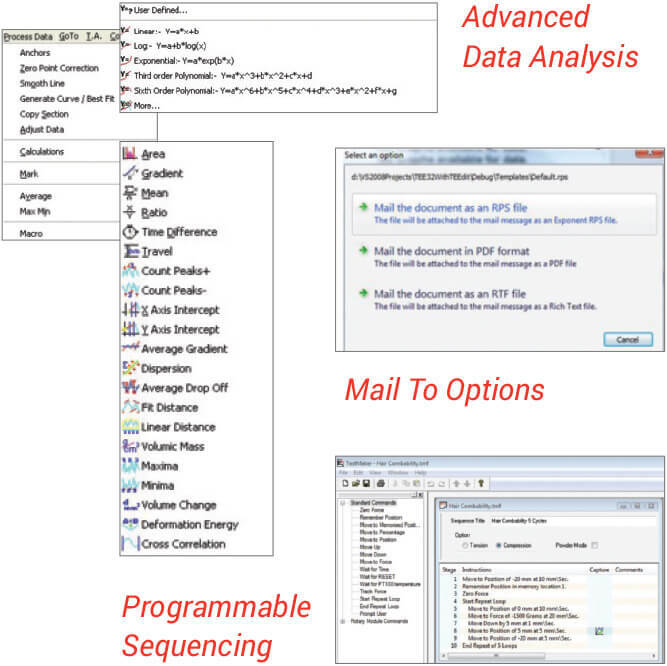 LIMS: Exponent can simplify the sending of analysis results to LIMS from most companies. 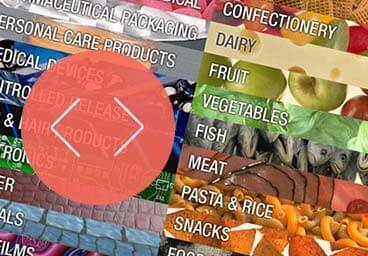 It comes in the form of a Macro command that can be easily configured to export the selected results of the current product to a file that a LIMS can read and delete. Enhanced Security Module: This additional module provides additional security such as electronic record and signature management if you need it or wish to run your instrument in accordance with FDA CFR21 Part 11 guidelines. Make sure you are running the latest version software! All updates are free for the lifetime of your instrument.